Deputy Prime Minister Barnaby Joyce has said further action will take place. The Greens have called on Prime Minister Malcolm Turnbull to intervene in the live export of Australian cattle to Vietnam following the release on Thursday of footage that shows what appear to be Australian cows being bludgeoned to death with sledgehammers on Thursday. The footage obtained by the ABC from animal welfare group Animals Australia has sparked a federal investigation into the apparent breach of live export regulations and the treatment of Australian animals overseas. 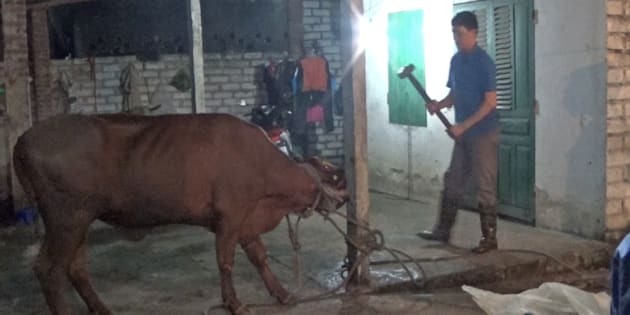 The video shows workers in a Vietnamese abattoir clubbing a distressed cow with a rope around its neck over the head with a sledgehammer until it falls to the ground and is beaten again until it dies. Lee Rhiannon, Greens Senator and animal welfare spokesperson, said: "Prime Minister Turnbull must respond to Animal Australia's call for urgent intervention to stop this horror. "The history of breaches and lack of action shows the Department of Agriculture is incapable of regulating the live export trade." Deputy Prime Minister Barnaby Joyce told the ABC that a live export ban is out of the question but further action is being taken. "Immediately when we found out about this we went straight into action," he said. "The Department [of Agriculture] has been working closely with the industry, the abattoir has been suspended from receiving cattle, we are investigating this process but further action needs to take place and will take place." The calls come five years after ABC program Four Corners aired an investigation into the treatment of Australian cattle in Indonesia, which controversially led the Gillard Government to implement a live export ban. Lisa Chalk, a spokesperson for Animals Australia, has said her organisation presented the government with similar concerns in 2015 without an effective response, according to The Guardian Australia. "Since then there have been more than a dozen complaints to the department of breaches in Vietnam and, when we went back last month, we found the problem has gotten worse," she said. The footage marks the second time Animals Australia has captured footage of the killing of Australian cattle with sledgehammers, claiming thirty thousand Australian breeding and dairy cattle have been sent to Vietnam over the past 12 months.